INTRODUCING THE NEW 7200 SERIES. Thermbond Refractory Solutions has reinvented the way that refractories are used and changed the way refractories are viewed. Breaking down previous barriers, Thermbond technologies have not only opened the door to making refractory repairs that were previously impossible, they have also paved the way to cost-saving full refractory replacements. Our products and our process can help you optimize production, manage your risk, and get the very most out of your refractory linings and shapes. When furnace equipment is down, dollars are lost by the minute. Industry professionals have long trusted Thermbond to get them up and running faster—and keep them running longer—so production levels stay high. As a global refractory manufacturer, Thermbond® helps companies that are frustrated with slow bake-out requirements, corundum build-up and repair failures, saving them time during outages—whether planned, or an emergency—while providing the long-term performance our products are known for. Thermbond provides refractory products that meet or exceed the needs of the Hydrocarbon Processing Industry, and offers proven technology that eliminates thermal dry-out restrictions during unit start up. Thermbond installations save time while delivering consistency and dependability, and are backed by outstanding technical and field service support. Thermbond provides solutions to major power suppliers worldwide, and offers proven technology that eliminates thermal dry-out restrictions during unit start up, removing one of the largest obstacles when putting a unit back on line. Whether your outage is planned or an emergency, Thermbond delivers superior performance and outstanding value by saving both time and money. 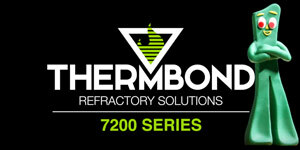 Thermbond refractory products and engineered solutions provide unique refractory options to the minerals processing industry. Depending on service conditions and downtime restrictions, Thermbond provides proven technologies, tailored to meet the most demanding service environments and tightest shutdown schedules. Combined with outstanding customer and technical service, Thermbond® offers value that exceeds expectations. Thermbond Insulating Solutions, featuring MAFTEC polycrystalline fibers, provide long-term lining systems for reheat furnaces in addition to ladle and tundish covers. This highly insulated solution dramatically cuts energy loss, and provides a consistent and uniform operating environment within furnaces, improves production and operational efficiencies and reduces scale development and material rework. Highly resistant to thermal environment, these solutions eliminate annual maintenance costs. Thermbond provides custom tailored solutions for a host of specialized industries. To learn how we can service your industry, contact a dedicated Thermbond advisor. CONTACT A THERMBOND ADVISOR TODAY. REDUCE COSTS THROUGH SUPERIOR REFRACTORY SOLUTIONS. WITH OUR PRODUCTS, COMES OUR ADVANTAGE. Nobody stands behind their refractory solutions like Thermbond. Whether you need help with a maintenance issue, or a brand new install, we’ll find or provide the resources you need quickly—to ensure your application is a resounding success. This is the Thermbond Advantage. No two situations are the same, and we understand that. But our first step with any client is the same, regardless… we listen. We believe it’s an important component in every successful partnership. Because we can’t evaluate your needs until we understand what they actually are. WHEREVER YOU ARE—YOU’LL FIND THERMBOND. Thermbond is available for virtually every refractory application, and is sold worldwide through a vast network of certified contractors and partners. Thermbond maintains sales offices across the United States in addition to global operations centers and sales offices in The Netherlands, United Arab Emirates, Mexico, India and Canada. Contact us today, and we’ll connect you with a Thermbond advisor near to you. We have used Formulas 3L, 4L, 6L, 4G, and 4P throughout our casthouse and have found no other material that will bond like it. We have used Thermbond in full wall replacement applications all the way down to veneering. 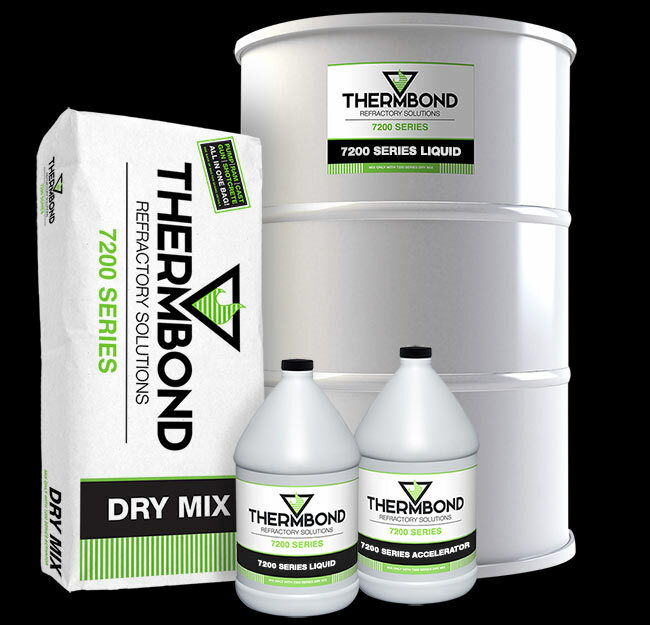 The Thermbond products have become a tried and tested part of our day to day maintenance activities, as well as in specialized areas of full furnace rebuilds. As a refractory contractor-installer in the aluminum industry, we have achieved great results utilizing THERMBOND products. We have found that the combination of high alumina, non-wetting characteristics and rapid set-up allow us to install durable, long-lasting working linings in a time-saving manner. We strongly believe that THERMBOND materials give us and our customers a solid competitive edge in the aluminum industry. We have been utilizing Thermbond Refractories in our furnaces for over 3 years now with great success. The Formula 4-L is used below the metal line in critical areas such as the hearth. The Formula 5-L is used above the metal line and the Formula 3-L is used in the furnace roof. Thermbond has saved us in the scope of repair work due to it’s unique bonding to existing refractory and in down time due to Thermbond’s rapid heat up capabilities. Thermbond formula 2104L was installed by MD Magary as a repair to the most severe wear furnace hearth. Refractory repairs to this hearth area have been very unsatisfactory in the past. The failure has been at the bond to the existing sub hearth. Complete hearth refractory repairs have not lasted very long due to the extreme abrasion from loading and cleaning operations making repairs to the hearth surface a frequent necessity. Formula 2104L was installed and has provided “amazing” ability to withstand the abrasion and mechanical abuse that no other refractory has been able to provide. We have installed over 4 pallets of Formula 6P to repair burner tile and boiler repairs in a couple of refineries. We also been pouring burner tile with your 6B and patching burner throats in a SRU with 18BL. We normally send 6 bags of 6 P when we go on jobs now. Material is doing good. I have been specifying and engineering Thermbond installations since 1996 for many different applications. The various Thermbond formulations are very unique and well suited for the refinery industry. They can be the refractory material of choice in quite a number of installations were time or longevity of service is critical. I am happy to spread the word.